This landmark research volume provides the first detailed history of entrepreneurship in Britain from the nineteenth century to the present. Using a remarkable new database of more than 9 million entrepreneurs, it gives new understanding to the development of Britain as the world’s ‘first industrial nation’. Based on the first long-term whole-population analysis of British small business, it uses novel methods to identify from the 10-yearly population census the 2–4 million people per year who operated businesses in the period 1851–1911. Using big data analytics, it reveals how British businesses evolved over time, supplementing the census-derived data on individuals with other sources on companies and business histories. By comparing to modern data, it reveals how the late-Victorian period was a ‘golden age’ for smaller and medium-sized business, driven by family firms, the accelerating participation of women, and the increasing use of incorporation as significant vehicles for development. 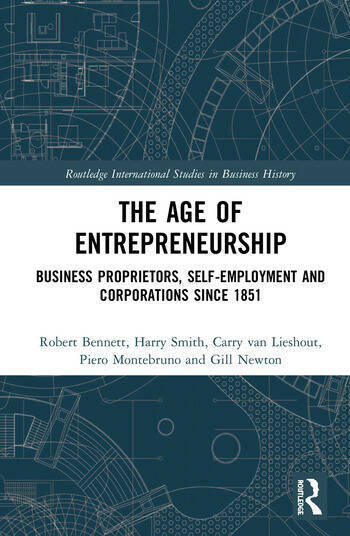 A unique resource and citation for future research on entrepreneurship, of crucial significance to economic development policies for small business around the world, and above all the key entry point for researchers to the database which is deposited at the UK Data Archive, this major publication will change our understanding of the scale and economic significance of small businesses in the nineteenth century. Robert J. Bennett is Professor Emeritus and Research Director in Geography at University of Cambridge, UK. His research covers SME policy, economic development, the history of entrepreneurship, chambers of commerce, and business associations. His recent publications include Entrepreneurship, small business and public policy (2014) and papers in multiple journals, including Business History. Harry Smith is a Research Associate at the Cambridge Group for the History of Population and Social Structure, UK. He is a historian with interests in 18th and 19th century social and economic history, entrepreneurship, and the history of class and towns (especially Birmingham). He has published articles in journals, including Business History and Midland History. Carry van Lieshout is a Research Associate at the Cambridge Group for the History of Population and Social Structure, UK. She is a historical geographer with interests in gender, entrepreneurship, and natural resources. She has publications in journals, including The London Journal and Geopolitics. Piero Montebruno is a Research Associate at the Cambridge Group for the History of Population and Social Structure, UK. He holds a PhD in economic geography and is a trained medical doctor with interests in entrepreneurship, surrogacy, and slums, and heavy-tailed distributions. He has published articles in journals, including Business History. Gill Newton is a Research Associate at the Cambridge Group for the History of Population and Social Structure, UK. She is a data scientist whose interests include large-scale datasets and demographic behaviour, mortality, and the occupational structure of 19th century Britain. She has published widely in the subject area of population history and its methodologies.